Baked mixture of eggs, cormeal and Campbells® Condensed Tomato Soup topped with tomato maple chipotle sauce. low-sodium baking powder	 3 tsp. ground chipotle chile powder	 1 1/2 tsp. 1. In a large bowl combine cornmeal, flour, sugar, baking powder and soda. 2. In a bowl, whisk together 1 qt. Campbell's® Condensed Tomato Soup, water, eggs, oil and chipotle powder. Reserve remaining 1-1/2 cups soup. 3. Add wet to dry and mix until blended. 4. Spray a full-size shallow steam table pan with non-stick cooking spray. Preheat in oven 3 minutes. 5. Pour batter into a pre-heated pan. Bake in 400°F oven until set, about 30-35 minutes. Remove from heat. Cool slightly. CCP: Cool to 70°F within 2 hours and to 41°F within an additional 4 hours. 1. 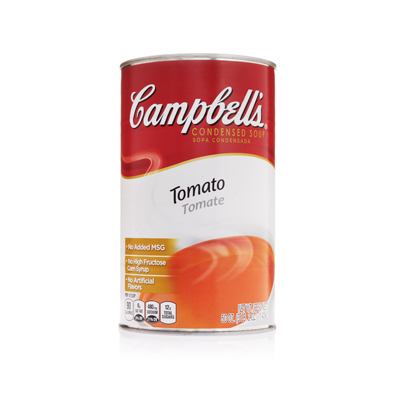 In a pot, combine remaining Campbell's® Condensed Tomato Soup (1 1/2 cups) and maple syrup. Bring to a boil. Reduce heat. Simmer for 3-4 minutes. 2. Mix in cilantro. Reserve. 1. Cut cornbread into 24 (5x5) pieces. 2. 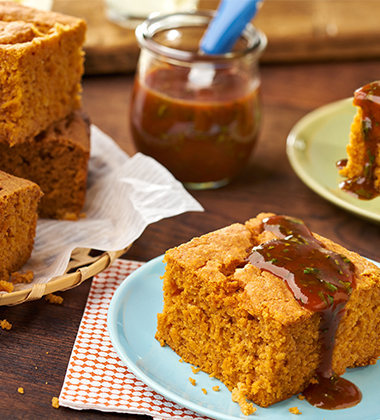 Using a heaping # 50 scoop (about 1-1/3 tablespoons), portion sauce on top of cornbread. Serve immediately. *See tips for additional serving suggestions. To make individual muffins, pour 1/3 cup batter into prepared muffin tins and bake as directed. 1. In a bowl, whisk together cream cheese, soup and honey until smooth. 1. In a saucepan, combine soup, honey and minced jalapeno pieces.